I’m proud to have set up the first known bike share program in the city of Los Angeles and thankfully welcome Streetsblog as the non-profit conduit for donations to this program. With this generous arrangement, the bike share program will be entering a new phase of usefulness and service to the community. 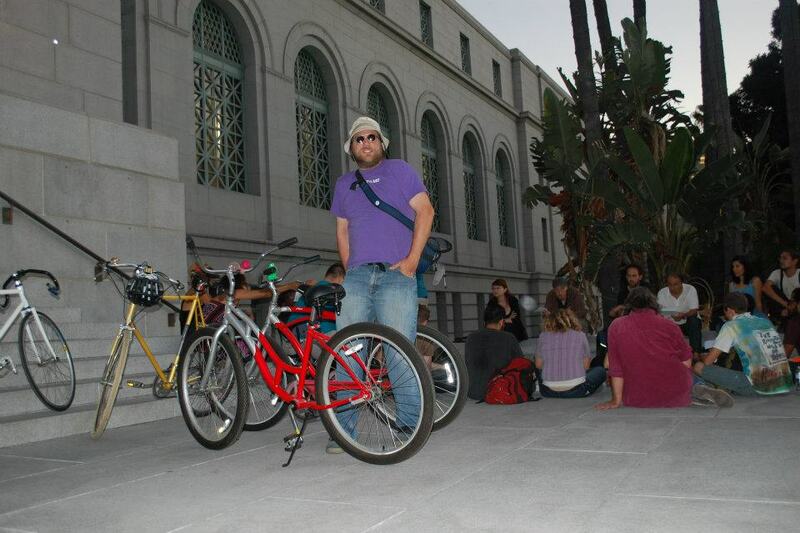 I set up the OccupyLA bike share with the intention of bringing the active transportation message to the occupiers themselves as I believe that we need to be the change we want to see in the world. If Occupy LA is to achieve some of the most important goals of the movement, people are going to have to learn to reduce their oil dependency – the very addiction that keeps our country involved in endless foreign wars. The taxpayers of the United States of America have spent trillions of dollars to bomb broke people on the other side of the earth for “cheap gas.” It stops with us. I would like to thank Alex De Cordoba, Mikey Wally, Joseph Bray-Ali, Cat Campion and Damien Newton for their kind and important donations thus far. I would like to thank the Bikescum collective for maintaining the bike share program thus far. One of the challenges of any bike share program is keeping theft issues to a minimum. This program is not different. However, from the outset I decided that the only way to implement this program was through the honor system. The occupy movement is fluid, people come and go and to keep track of some kind of deposit system would not be feasible. I was therefore resolved to lose all of the bicycles eventually to theft and be ok with that since, after all, we could assume that whom ever decided to steal the bike would be using it. I paint each of the bikes with gold paint to identify them and with a combination lock, multiple people at the bike camp can access them to loan out to those who make face to face contact and ask for their use. Simple beach cruiser style bikes or single speed adult size bikes.